The Democratic Party presidential candidates will hold a two hour long debate Saturday starting at 9 p.m. EST, 6 p.m. PST at Drake University in Des Moines, Iowa. The debate will be broadcast by CBS News and can be viewed on over-the-air CBS television and radio affiliates as well as various online streaming sources. The candidates: Former Gov. Martin O'Malley of Maryland, Sen. Bernie Sanders of Vermont and former Secretary of State Hillary Clinton of New York. Co-hosting the debate are CBS News, the Des Moines Register and CBS affiliate KCCI-TV. Debate moderator: CBS News Face the Nation host John Dickerson. Questioners: CBS News Congressional Correspondent Nancy Cordes, KCCI anchor Kevin Cooney and the Des Moines Register's political columnist, Kathie Obradovich. Questions posed on Twitter using the hashtag #DemDebate will be used for some of the questions. Via CBS News, here is a list of online,streaming and mobile sources for the debate. Android TV and Xbox One. Mobile: CBSN streaming on the CBS News apps CBS News for Android and CBS News for iOS. Pre-debate coverage begins at 8 p.m. EST, 5 p.m. PST. Wanna bet they don’t get asked about Paris? It’ll be the same old garbage. Free everything for everybody, but don’t ask how it’s going to be paid for. And Climate Change. I’ll give it a miss. Speaking of the dimoKKKRATS I have not heard peep out of them regarding ISIS. I imaging Hillary is still busy looking for a video to blame things on. They need to ask her about the Arab Spring thing. I need to take my Dremel rotary sanding drum to my problematic toenail growth. I’ll be organizing my sock drawer. Geez.....and, I thought Obama was gonna make a surprise appearance to tell us all, how he, singlehandedly, has now contained ISIS!!! Nah...I decided not to watch this Democrat grouping of America Hating, human vermin!!! Sorry, i will not be part & parcel to the estimated 40,000,000 viewers that will be glued to their TV screens!!! I’ll read how “Hillary” swept our nation off its feet, in the morning!!! LMAO!!! Thank you, Kristinn, but....softball questions and canned answers. I think I'll pass. This debate will be just another liberal worshiping service for the Bernie and Hillary fans. Where can we download the questions and answers PRIOR to the “debate” aka liberal promo. 99.9% of Iowa TV’s will be turned to the Hawkeyes game.. I think I’ll get some teeth extracted instead. 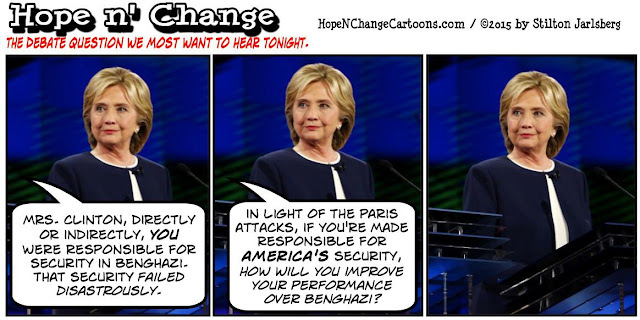 Mrs Clinton, if you were president how would you respond to the Paris bloodbath? HILLARY: First, I would check the Clinton Foundation donor list to see if any of the Paris terrorists partnered w/ us in our global do-good projects. If not, I would instruct the Clinton Foundation to draft a letter, asking them to join us in ridding the world of poverty, pestilence, and political instability by contributing several million dollars. The Clinton Foundation is the only way to restore peace and order throughout the world. But I would not stop there. I would direct Marie Harf, my Secretary of State, to run Help Wanted ads to offer well-paying jobs to all Syrian refugees who have ISIS credentials.